Amber discovered the beauty of hula hooping as a spectator at music festivals. Three years ago, she bought herself a hoop and discovered hooping for herself. Three years later, Amber is still in her hoop, discovering more and more. She loves hooping because of the smile it puts on her face and in heart every time she plays with it. She loves the hoop for its continued challenge: there are always more rotations, folds, twists, rolls, isolations, jump-throughs, balances, and more tricks to be discovered. 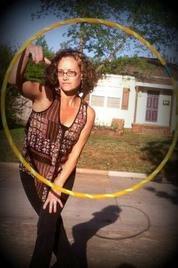 Currently, Amber brings her hooping experience to schools to share the smiles of hooping with kids, as well as bringing her expertise to Tulsa Hoop Dance Class every Monday at Flyloft from 6-7 p.m.
For Amber, hooping keeps a brain thinking, keeps a body fit, and keeps a person social. That's right, social! Hooping is a very social activity without competition. It invites play and connection between people. Hooping can be shared and enjoyed by all. Come Play! ​Ray has been hooping for 2 years now after a long time friend got him into it, and has only gotten more serious about his hoop journey as time goes on. Ray started by helping Lesley tape the hoops that she'd made and fell in love with that circle as soon as he started spinning it around his waist. When Ray hoops he feels the most at peace. He really enjoys teaching beginner, intermediate, and advanced hoopers. He's great at one on one instruction and always tries to be as helpful as possible. Ray has played with all types of hoops - from fire to mini's -but by far, fire is his favorite! He says, "There is something about fire that makes you feel free; not to mention, it helps you nail the moves you've been working on. I urge every hooper to try it at least once, even if it's just one move. I'm always up for spreading the hoop love. Hooping is something that helps connect me with myself as well as others through a simple circle. I've found endless beauty in hooping and will continue teaching what I've learned. I enjoy working with hoopers of all ages! 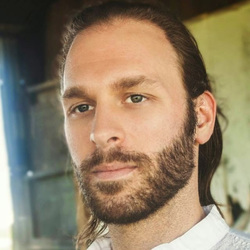 Austin was born and raised in Tulsa, living for a short time in Nashville where he began playing violin and cello. After moving back to Tulsa--to attend Barthelmes Conservatory summer programs--he stayed and finished high school, graduating from Tulsa Central where he received the Great Spirit Award. He attended Tulsa Community College and University of Tulsa where his focus was music, and is a graduate of Leadership Arts class 5. He coaches the cello section of the Tulsa Honors Orchestra and keeps a small number of beginning and intermediate cello and violin students. Austin assists in facilitating events at the Oklahoma Jazz Hall of Fame and Living Arts--where he is a member of the New Music Committee. Austin composes, arranges, and transcribes music--songs by the Beatles are his favorite. Austin is ordained in the Church of the Dude.